Compression springs are one of the most common springs used in products, machinery and variety of other applications. Although they may seem simple in design, the smallest changes can make a substantial difference in their performance, longevity and many other factors. When it comes to compression spring design, precision matters. At The Yost Superior Co., our engineers are highly experienced in creating custom orders of compressions springs, taking into account the precise specifications of each and every one of our clients. Compression springs are open-coil helical springs that resist compressive forces as they are applied to them. When a heavy object or force is applied to the spring, it condenses, storing the force until it is eventually released. These types of springs are the most common springs in many industries because of the efficiency in which they store energy. Compression springs can come in many shapes, sizes and can be fit into a hole or placed over a rod within a particular application. 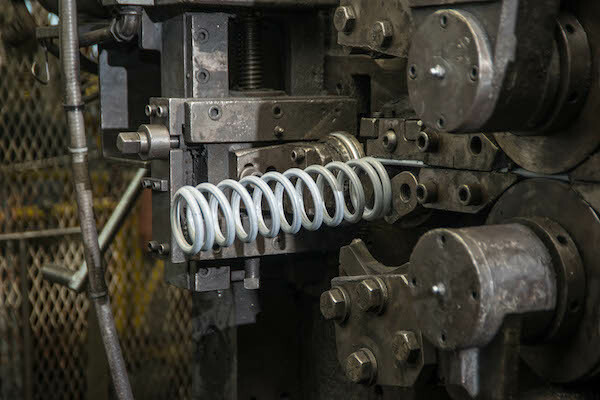 Its versatility makes it easy to customize based on your needs, and our team at the Yost Superior Co., can configure your springs to exhibit unique characteristics such as extreme space efficiency, nonlinear load deflection, improved energy storage capacity, and a many other factors. If you deliver our team the precise specifications, we will be able to create a spring that has a unique way in which its load bearing function can be applied. What Goes into Compression Spring Design? Compression spring design is remarkably complex, but this complexity allows for our designers to make small, but influential changes to the spring, allowing it to be used in a variety of applications and settings. Compression spring design requires precise calculations to get right, but you can be as specific or as vague with your order as you need to be. Our team understands the complexity of spring design so you don’t have to. Even if you are unsure what characteristics you need in your compression spring order, we will help you determine precisely what you need and deliver it to you promptly. Because it is absolutely essential for spring manufacturers to be on the same page as their clients when it comes to their spring design, our team will work closely with you throughout your entire order, helping to guide you through the process from start to finish. In the end, we will deliver you a spring that performs with remarkable redundancy, reliability and longevity. At The Yost Superior Co., we place a heavy emphasis on precision, reliability and customer service. We put our hearts and minds behind every order of custom springs we deliver. To get started today, request a quote or contact our team.